Below are all of the contributors to Who's Who of Victorian Cinema, with a short description for each and a listing of the entries written or co-written by them. Barry Anthony is an authority on Victorian stage entertainment and is co-author with Richard Brown of A Victorian Enterprise: The History of the British Mutoscope and Biograph Company, 1897-1915. 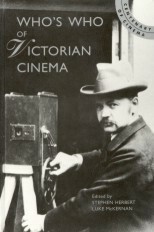 John Barnes was the author of the standard work on British Victorian cinema, the five volume The Beginnings of the Cinema in England, 1894-1901. He died in 2008. Dave Berry was the author of Wales and Cinema: The First Hundred Years. He died in 2010. Ivo Blom teaches film history and theory at the Vrije Universiteit, Amsterdam. In 2003 he published Jean Desmet and the Early Dutch Film Trade. Stephen Bottomore is filmmaker and writer, researching into many aspects of early cinema. Henri Bousquet has produced a multi-volume catalogue of early Pathé production. Richard Brown is a freelance historian and co-author with Barry Anthony of A Victorian Enterprise: The History of the British Mutoscope and Biograph Company, 1897-1915. Ian Christie is Professor of Film and Media History at Birkbeck College, London, and an authority on Russian and Soviet Cinema. Brian Coe was curator of the Kodak Museum, and was the author of The History of Movie Photography. He died in 2007. David M. Copeland has researched Willie Riley of Riley Bros. for over twenty years and completed a two-year Master of Philosophy degree at the University of Bradford about the life, works and legacy of W. Riley in 2009. Roland Cosandey teaches in Lausanne, Switzerland. He has published works on the Swiss cinema, animation and various aspects of early film. Peter Domankiewicz (aka Carpenter) is a filmmaker with a particular interest in William Friese Greene and his associates. Denis Gifford was the author of the British Film Catalogue (fiction and non-fiction volumes) and numerous works on film, radio, and comics. He died in 2000. Frank Gray is Curator of Screen Archive South East, England, and a Senior Lecturer in Media Studies and Art History at the University of Brighton. Luis Guadano is Associate Professor of Spanish at Old Dominion University in Virginia, USA. His field of research is Spanish film and visual media. Mervyn Heard was an authority on magic lanterns, fairgrounds and other forms of Victorian entertainment. He died in 2017. Stephen Herbert is an independent publisher and moving image consultant, and former Head of Technical Services at the Museum of the Moving Image, London. Nicholas Hiley has researched widely into the British media at the turn of the century. David Lee is Archivist at the Wessex Film and Sound Archive, Winchester, England. Juan Pablo Lepra is a marketing consultant in Uruguay. He wrote his BSC dissertation on Félix Oliver and is preparing a film script on the Uruguayan pioneer. Chris Long has written a series of articles entitled Australia's First Films: Facts and Fables for the journal Cinema Papers. Janet McBain is a former Curator of the Scottish Screen Archive, now retired. Luke McKernan is Lead Curator, News and Moving Image, at the British Library. Laurent Mannoni is the author of Le grand art de la lumière et de l'ombre. He is responsible for historical apparatus at the Cinémathèque Française. Theodoros Natsinas is an historian of Greek cinema. David Robinson is the author of works on Charlie Chaplin and Georges Méliès and a history of the cinema. He is Director of Le Giornate del Cinema Muto silent film festival. Deac Rossell is a former Head of Programming at the National Film Theatre and the author of The New Thing with the Long Name and the Old Thing with the Name That Isn't Much Shorter, a major chronology of the cinema to the end of 1896, and Living Pictures: The Origins of the Movies. Martin Sopocy is the author of James Williamson: Studies and Documents of a Pioneer of the Film Narrative. Vanessa Toulmin is Research Director of the National Fairground Archive, University of Sheffield. Rashit Yangirov was a journalist and freelance historian of early Russian and Soviet cinema. He died in 2008. We also acknowledge the help of the following in producing both the original book and/or this updated web version: Piotr Andrejew, Dusan Barok, Robin Bishop, Sid Brooks, William Drew, Tony Fletcher, Thomas Ganz, Hiroshi Komatsu, Kumio Maekawa, Alison McMahan, Christian Martinache, Tony Martin-Jones, Graham Melville, Simon Popple, Clifford Shaw, David Simkin, Wilf Stevenson. The editors would particularly like to thank Charles Musser, Deac Rossell and the late John Barnes for their special collaboration. Most of the images reproduced on this site have come from the British Film Institute and private collections. The editors welcome any queries from copyright owners concerning the illustrations used.